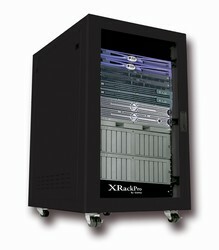 XRackPro2 server rack models reduce noise up to 80% in the rackmount systems mounted inside the enclosure cabinet. Rack mount servers, RAID systems, computers and any other loud equipment will become much quieter in our server racks. XRackPro2 server racks are specifically designed to keep most noise inside the enclosure cabinet and what little amount does escape the server rack will be significantly reduced in volume and will have a more pleasant pitch. 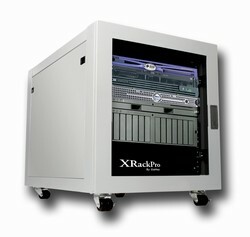 XRackPro2 server racks have security from front and rear locking doors. XRackPro 25U and 12U server racks have pre-installed heavy duty caster wheels for mobility of a rolling rack system, 6U and 4U XRackPro server racks have optional caster wheels. $160.00 additional charge for liftgate serive at delivery. Service is required when a loading dock or forklift are not available. $100.00 additional charge for inside delivery service. XRackPro2 is a server rack rackmount enclosure cabinet specifically designed for noise reduction and mobility. Rackmount computer servers and RAID storage become whisper quiet in this rolling rack system. Solidly built and providing 4U of industry standard 19” (48.2 cm) wide rackmount space, the second generation XRackPro2 is an ideal server rack and computer cabinet for Apple (Xserve server and Xserve RAID), Windows (Dell, HP, IBM, etc. ), Linux, SGI, Sun and other PC computer rackmount servers. The XRackPro2 is also a great solution for video, audio or any other rackmount equipment that can benefit from a reduction in noise and increased mobility. A few combinations of rackmount 1U, 2U, 3U and 4U servers, disk arrays or other equipment can be mounted inside this cabinet enclosure. Using fully adjustable mounting rails and a built-in cable management system, the XRackPro2 can be configured for your individual needs. Each 1U of rackmount space is clearly marked, making set up a breeze. Noise from rackmount equipment mounted inside the XRackPro2 will be reduced from the sound dampening design while keeping everything cool at the same time. All external panels are lined with specially engineered acoustical foam and the wire grommet has foam insert to keep noise inside XRackPro. XRackPro2 features heavy duty steel construction and all rackmount servers, storage solutions and other equipment stay visible through the use of the sealed glass front door. Superior strength, surface safe leveler legs are used, optional caster wheels can be added to create a rolling rackmount enclosure that is sturdy, yet easy to move when needed. The optional industrial strength rear casters can be locked in to position when the XRackPro rack mount enclosure is moved to a desired location, the casters can be unlocked again later if relocation is needed. Eight cage nuts and screws are included to mount an initial installation of rackmount computer servers, disk arrays, etc. With the benefits of noise reduction and security that the XRack Pro 2 provide, rack mount servers, RAID systems and other components can now be used in environments where they could not before. Video and audio suites, production and creative departments, hospitals, libraries or any other locations that need to keep sound levels down will benefit from this innovative product. *Please note: due to shipping weight, XRackPro enclosures require additional shipping charges. An associate will contact you with correct shipping charges before processing your order. Solidly built and providing 6U of industry standard 19” (48.2 cm) wide rackmount space, the second generation XRackPro2 is an ideal server rack and computer cabinet for Apple (Xserve server and Xserve RAID), Windows (Dell, HP, IBM, etc. ), Linux, SGI, Sun and other PC computer rackmount servers. 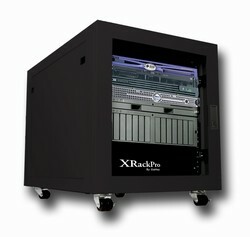 XRackPro2 is a rackmount enclosure cabinet specifically designed for noise reduction and mobility. Rackmount computer servers and RAID storage become whisper quiet in this rolling rack system. 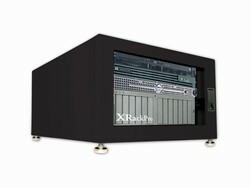 Solidly built and providing 12U of industry standard 19” (48.2 cm) wide rackmount space, the second generation XRackPro2 is an ideal server rack and computer cabinet for Apple (Xserve server and Xserve RAID), Windows, Linux and other PC computer rackmount servers. The XRackPro2 is also a great solution for video, audio or any other rackmount equipment that can benefit from a reduction in noise and increased mobility. Several combinations of rackmount 1U, 2U, 3U and 4U servers, disk arrays or other equipment can be mounted inside this cabinet enclosure. Using fully adjustable mounting rails and a built-in cable management system, the XRackPro2 can be configured for your individual needs. Each 1U of rackmount space is clearly marked and cables can be neatly arranged by utilizing the cable management system, making set up a breeze. Noise from rackmount equipment mounted inside the XRackPro2 will be reduced by as much as 75% from the sound dampening design while keeping everything cool at the same time. All external panels are lined with specially engineered acoustical foam, each door opening is sealed and all wire grommets have foam inserts. XRackPro2 features heavy duty steel construction and all rackmount servers, storage solutions and other equipment stay visible through the use of the sealed glass front door. Superior strength, carpet safe caster rollers are used to create a rolling rackmount enclosure that is sturdy, yet easy to move when needed. The industrial strength rear casters can be locked in to position when the XRackPro rack mount enclosure is moved to a desired location, the casters can be unlocked again later if relocation is needed. Twenty-four cage nuts and screws are included to mount an initial installation of rackmount computer servers, disk arrays, etc. With the benefits of noise reduction and mobility that the XRack Pro 2 provide, rack mount servers, RAID systems and other components can now be used in environments where they could not before. Video and audio suites, production and creative departments, hospitals, libraries or any other locations that need to keep sound levels down will benefit from this innovative product. 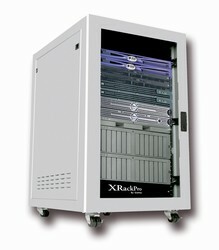 XRackPro2 is a server rack kmount enclosure cabinet specifically designed for noise reduction and mobility. Rackmount computer servers and RAID storage become whisper quiet in this rolling rack system. 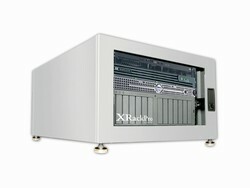 Solidly built and providing 25U of industry standard 19” (48.2 cm) wide rackmount space, the second generation XRackPro2 is an ideal server rack and computer cabinet for Irix (SGI), Linux (Red Hat, etc. ), OSX (Apple Xserve), Solaris (Sun), Windows (Compaq, Dell, HP, IBM, etc.) and other PC computer rackmount servers. The XRackPro2 is also a great solution for video, audio or any other rackmount equipment that can benefit from a reduction in noise and increased mobility. Several combinations of rackmount 1U, 2U, 3U and 4U servers, disk arrays or other equipment can be mounted inside this cabinet enclosure. Using fully adjustable mounting rails and a built-in cable management system, theXRackPro2 can be configured for your individual needs. Each 1U of rackmount space is clearly marked and cables can be neatly arranged by utilizing the cable management system, making set up a breeze. Noise from rackmount equipment mounted inside the XRackPro2 will be reduced from the sound dampening design while keeping everything cool at the same time. All external panels are lined with specially engineered acoustical foam, each door opening is sealed and all wire grommets have foam inserts.